The Space Makers Agency is a London based organisation that works with local communities and organisations to create sociable spaces and sustainable local economies. As part of this project the SMA often makes temporary use of empty spaces and underused buildings. Recently the Space Makers Agency have received a lot of press in the UK for their transformation of twenty empty shops in Brixton, London. The Brixton Village indoor market has been transformed by a partnership of the SMA, the local community and local artists into a rolling festival of galleries, theatres, weekend events and new shops and restaurants. Now the Space Makers Agency, in partnership with the Royal Institute of British Architects, has created a Google Map to help map London’s forgotten and abandoned spaces. The Mapping Forgotten Spaces site aims to encourage comment, suggestions and debate about how these spaces could be better used in the future. 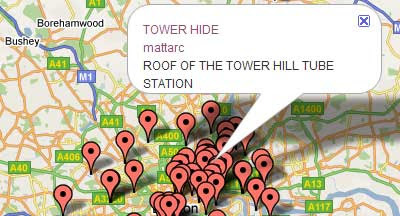 The map shows the locations of spaces in London that have been forgotten, are under utilised or neglected. Site users can then comment, suggest and debate ideas for how these spaces could be better used in the future.